202 pages | 47 Color Illus. You’ve planned your revision and you know your subject inside out! But how do you apply what you have learned to get the best marks in the examination room? Routledge Q&As give you the ideal opportunity to practice and refine your exam technique, helping you to apply your knowledge most effectively in an exam situation. Each book contains approximately fifty essay and problem-based questions on topics commonly found on exam papers, complete with answer plans and fully worked model answers. Our authors have also highlighted common mistakes as well as offering you tips to achieve the very best marks. What’s more, Routledge Q&As are written by lecturers who are also examiners, giving you an exclusive insight into exactly what examiners are looking for in an answer. 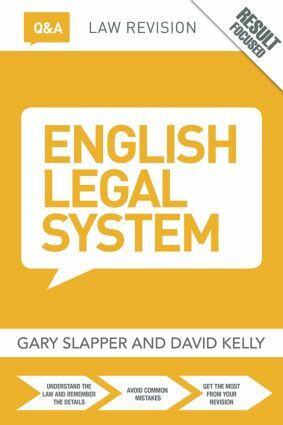 Gary Slapper is Global Professor at New York University and Director of New York University in London; Door Tenant, 36 Bedford Row, the Chambers of Frances Oldham QC; Visiting Professor of Law at The Open University and The Chinese University, Hong Kong. Routledge Q&As give you the tools to practice and refine your exam technique, showing you how to apply your knowledge to maximum effect in an exam situation. Each book contains up to fifty essay and problem-based questions on the most commonly examined topics, complete with expert guidance and fully worked model answers. Books in the series are also supported by a Companion Website that offers online essay-writing tutorials, podcasts, bonus Q&As and multiple-choice questions to help you focus your revision more effectively.